The weekend had come and gone so quickly that I can't believe that it's already Thursday! Where did the week go?? I'm blaming the memory loss of the past few days due to the early nights and mornings that I've had all weekend, and to the utterly random fever that the Munchkin had yesterday. It was quite weird really. The Munchkin was having a pretty normal day until 4pm rolled around. We were outside playing when he all of a sudden he just had to have me pick him up so that he could lay his sweet head down on my shoulder. He became very quiet and didn't want to be outside at all any more. Which is really weird since there's usually a fight to get him to go back in the house. But back in the house we went. Again, it was unusually weird that the Munchkin remained so quiet and didn't put up a fight over anything. He did cry when I tried to put him down, so instead I played Toy Story while I held him. Sitting there watching the movie, I literally felt the wave of the fever hit, moving from his head all the way to the tip of his cute little toes. My poor baby! Yet this morning he woke up and everything was as if that fever had never happened. Odd. Very odd indeed. I didn't get up to much over the weekend. I did some knitting but my hands started to get sore, so I stopped for a bit. I did some sewing, but nothing exciting to blog about (I was fixing a zipper on a dress). I did some quasi-baking though. I had taken one of those free magazines that Thrifty's offer at their check-outs. Inside was a recipe for caramel baked apples that had peaked my interest. Brett isn't a fan of dessert, so I rarely get the chance to make anything dessert-like. The recipe was fairly simple and consisted of ingredients that I already had in my pantry. I was a little nervous about the outcome for reasons unknown, and Brett had admitted (after he had inhaled his bowlful) that he wasn't sure if he would like what I was baking up. Solely because our tastes in sweets are very different. We were both pleasantly surprised that the dish came out completely yummy and had left us licking our glasses for every last bit! Unfortunately my photos don't do the dessert any justice. It was night, I had really craptastic lighting, and I think my camera is on the verge of dying. I'd be surprised if it'll last 'til the end of the year. Preheat oven to 350°F. Place 2 tbsp of butter and brown sugar in a small pot and set over medium heat. Cook, stirring occasionally, until sugar melts. Mix in flour until well combined. Very slowly whisk in the cream. Bring mixture to a simmer and simmer 1 to 2 minutes, until light;y thickened. Remove from heat and stir in vanilla (make sure this is a good quality vanilla, cause it plays a huge roll in how the caramel tastes!). Brush the bottom of a 9"x13" baking pan with the remaining butter. Place the apples, lemon juice, and cinnamon in a bowl and toss to coat. Arrange apples in the baking pan, cut side up. Spoon the caramel sauce over the apples, sprinkle with pecans, cover pan with foil, and bake about 40 minutes, or until the apples are just tender. Set 2 apple halves in a bowl, spoon sauce over top, and garnish with a sprig of mint. Serve with a dollop of whipped cream or a scoop of vanilla ice cream. I halved the recipe, since it was going to be only me and Brett enjoying the treat. 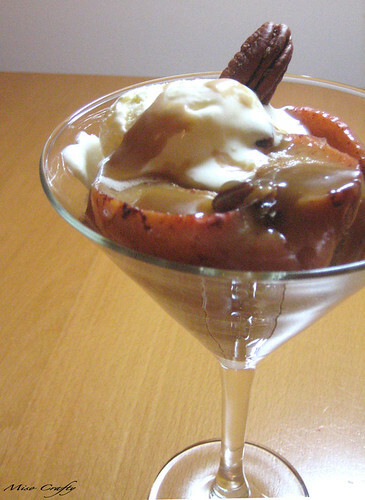 I served the apples with some vanilla ice cream in martini glasses, since I don't have actual dessert bowls. I didn't have fresh mint on hand, so I sprinkled a few broken pecan pieces on top and then used a whole pecan as my garnish. Brett made me promise that I would make this again this weekend, it was that good. A few days after making this, even I was still thinking about it! I definitely think this recipe is a keeper! That looks delicious! I will DEFINITELY be trying this out soon! They are addicting Kim! I think a new must bake for the fall season!